the unassuming island home of Ingrid Bergman from 1958 until her death 25 years later. CANTY headed for the next NAS cruise destination while we turned into a lovely town harbor just around the corner. 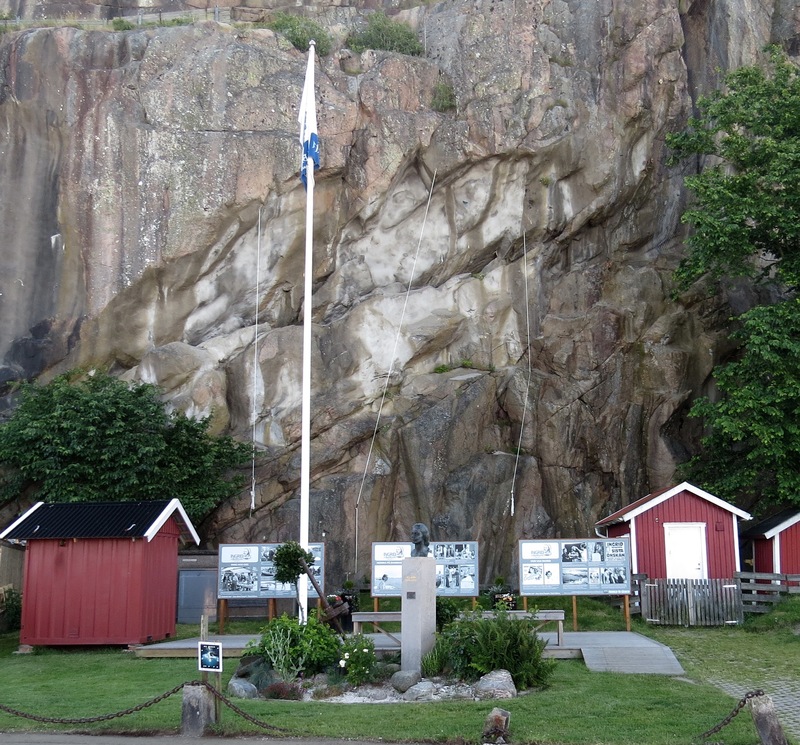 The town where we were headed for the night, Fjallbacka, honors this famous actress with a small square named after her and billboards documenting her time here. You may have noticed the huge, looming wall of stone backing the Ingrid Bergman memorial. Well, you can climb this piece of rock to capture a view out to the sea. 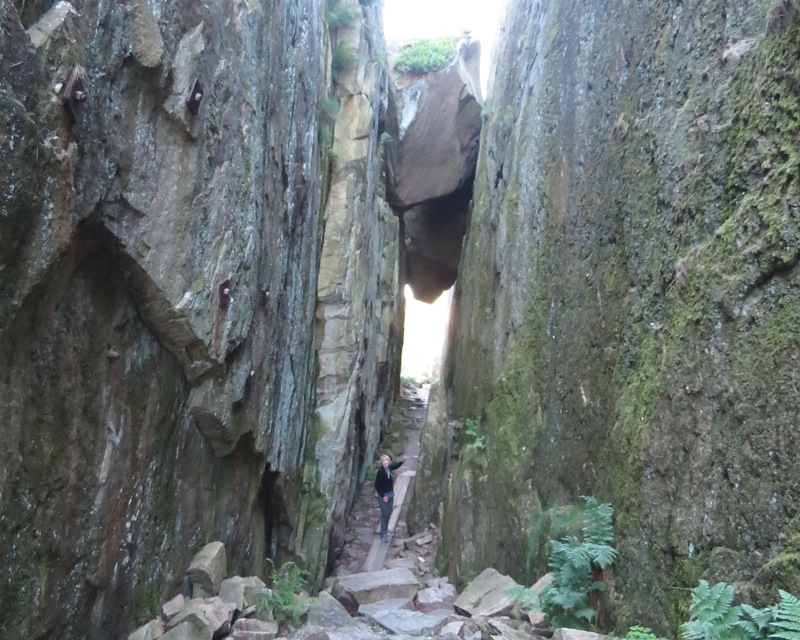 Swallowing my trepidation of scrambling over some stones then ascending a steep stairway, we set out to do so. First, though, you walk under the threat of being crushed to death, which I pointed out to my husband. Only to find that on the other side a paved road brought you to the stairway. However one gets there, it was definitely worth the view from the top as mentioned by our friends the Bruces and Rogers who’d been there. We snapped portraits while I ensured neither of us got too close to the edge. 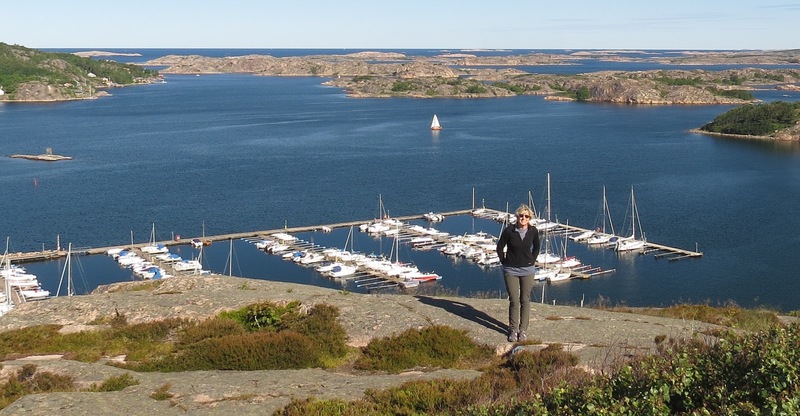 In addition to being a storybook-looking town nestled against a protective stone wall, Fjallbacka offered us the opportunity to visit the Vitlycke Museum and its Bronze Age rock carvings 10 miles inland. The small Tourist Information (TI) office’s posted hours indicated it was closed, but when we walked back along the sidewalk we found it open. A bustling but smiling local greeted us saying the regular person had retired and now the local historical society had taken on the TI job. They must have offered hospitality training for this lovely woman couldn’t have been more helpful. 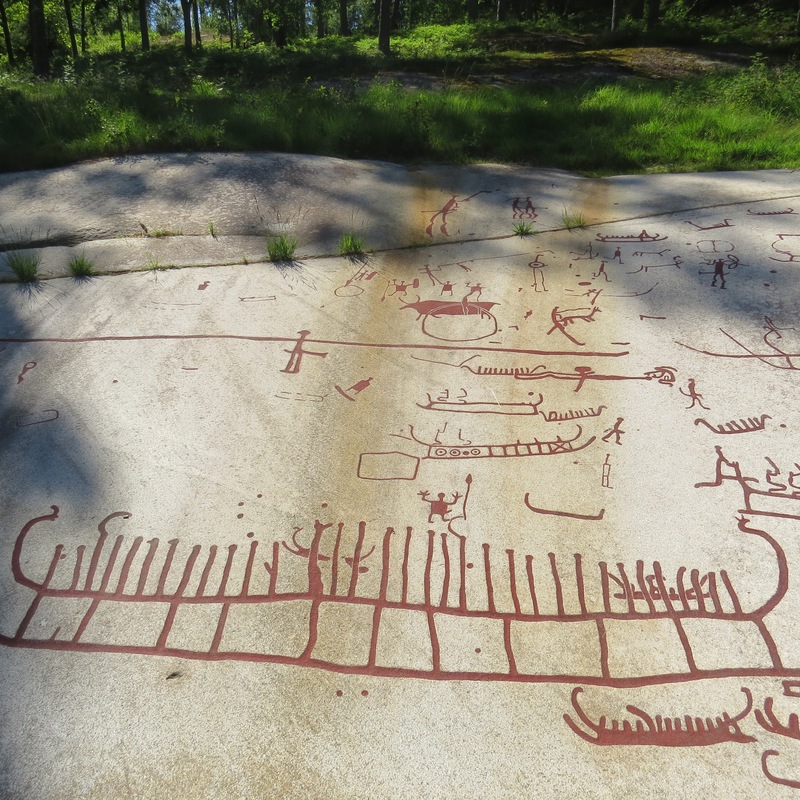 Our primary purpose for being in Fjallbacka was to visit the museum and its Bronze Age Cave Carvings (or Cave “Chiselings” as the guides told us). With the regular tourist bus not starting until July 1 we could either hitch or take a cab. Our previous attempts at hitchhiking this summer hadn’t produced a single ride so we kept our thumbs tucked in and opted for a cab. Within 15 minutes we arrived at the museum, a site on the UNESCO World Heritage List since 1994. 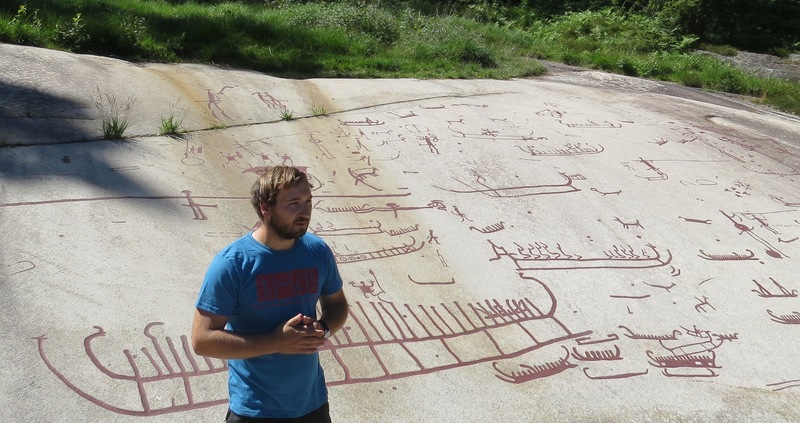 With four rock carving sites spread throughout 45 km2 we managed to reach two of them on foot and the museum. Our timing allowed us to join a guided tour in English to the main site, the Vitlycke Panel. Here we learned that where now we looked out, a green meadow use to be water. The sea level was 15 m (about 50 ft) higher 3,000 years ago and the climate akin to southern France. Very few females are depicted but they believe this scene called ‘The Grieving Woman’ (females have a ponytail and/or wear a long robe) cradles a man lying with his head between her knees. Another famous image is the ‘Lovers’. They surmise this represents a sacred marriage promoting fertility in humans, animals and crops: where a man or god dies and is reborn once a year to marry a goddess. 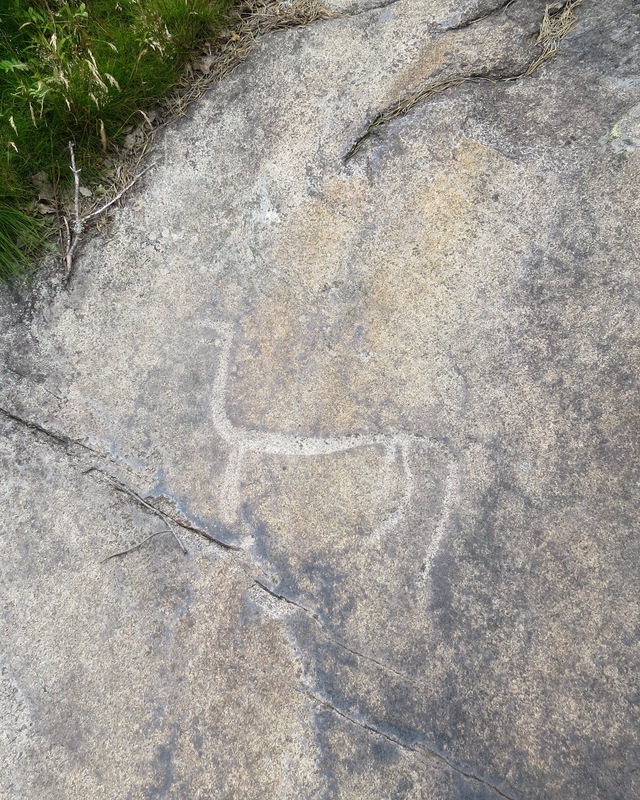 Being located in Nordic lands archaeologists tie many of these chiseled images to myths associated with the Vikings, such as the symbolic use of the hammer or axe, held by the figure next to the lovers. This pairing occurs often so maybe this figure is blessing the coupling? Many researchers believe the Bronze Age is the start of the Nordic gods, Odin, Thor and Freya. Based on that this scene of the man with a horned helmet in a horse/goat-drawn, two-wheeled cart could be Odin, and the squiggly snake right in front of him, a lightening bolt. 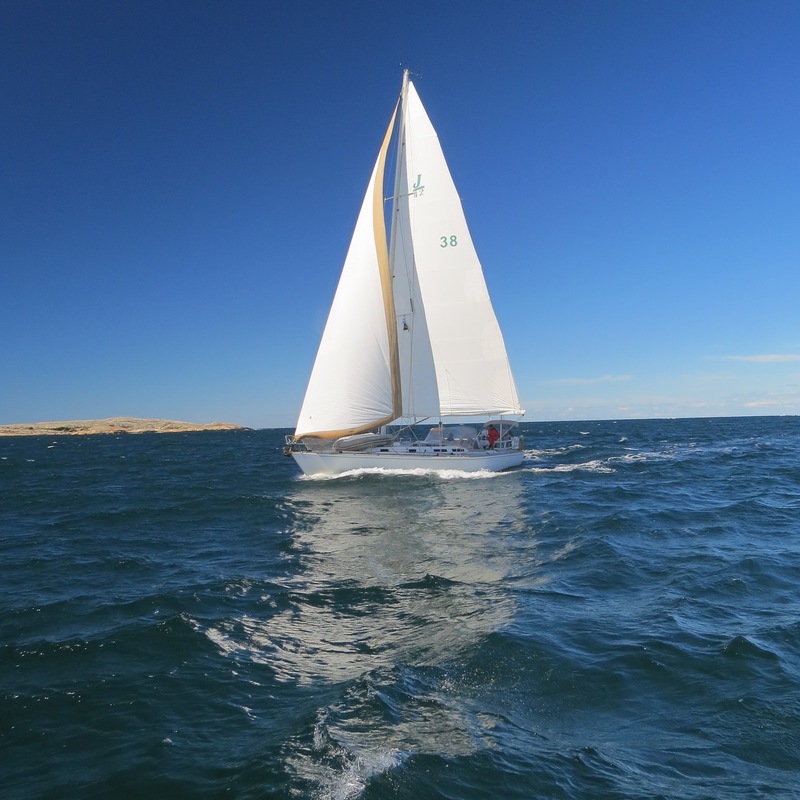 Thankfully, boats are one of the few ways archaeologists can date some of these images. They match them to drawings found on Bronze Age artifacts. At the Aspeberg site, aka “The Holy Mountain” due to the number of rock carvings in the area, we saw the famous sun symbol. Held by two females and two undetermined gender figures this image is considered the best sun symbol in this Bohuslan Province. Below you see bulls or cattle representing the importance of livestock (and farming) to the Bronze Age people. You can make out in the middle, righthand side a man plowing. Since archaeologists say all of the carvings during the Bronze Age are never of everyday life this guy must be performing a religious rite for regrowth of crops. The chiseled images weren’t painted this brick red. The archaeologists did it for easier viewing (see above non-red chiseled image) and to ensure tourists didn’t attempt filling in the stone troughs in order to take better pictures. What I also found interesting was the museum’s displays connecting this site with others around the world. For example, researchers find a strong similarity between these carvings in Bohuslan and those found from the Greek Minoan and Mycenaean cultures during the Bronze Age. Behind the museum we toured a typical Bronze Age farm or household. Since communities didn’t really start until later, generally a family of 12 or so would live in one area and in one big structure. Towards the end of the Bronze Age when the climate became colder, the livestock would be in one side and people in the other. As someone mentioned in their description these people didn’t live as primitive of a life as he had originally thought. I’d have to add my nod to that. Although I’m not so sure about the hygiene. 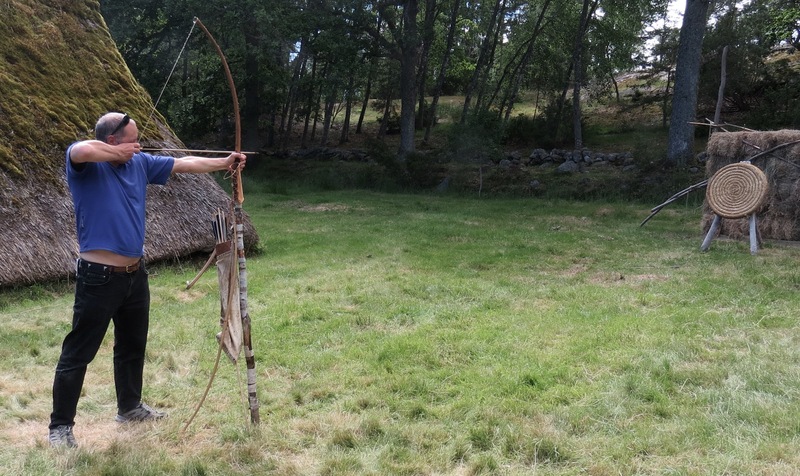 We spotted a young fellow dressed in clothes from the Bronze Age (not too, too bad of an outfit) offering visitors the opportunity to use a bow and arrow. With a last name of Fletcher derived from fletching the bow’s feathers, you know who couldn’t resist. Being asked if I liked to, I said sure and stepped up.